Oh, my—it’s been an interesting few weeks! 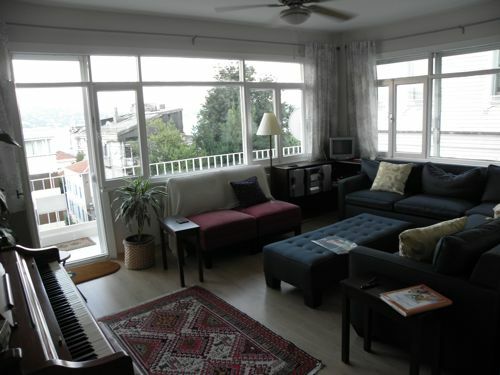 My friends Norma and Arvid just left for Minneapolis after a full schedule in Istanbul. 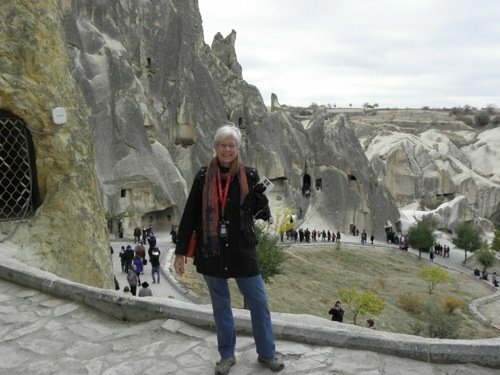 During the Kurban Bayramı we trekked to Cappadocia, one of my favorite spots in Turkey. 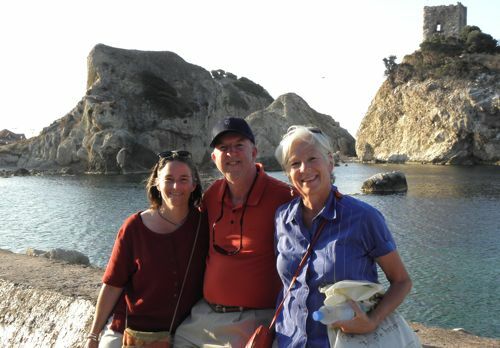 It has amazing geological formations (fairy chimneys), warm people, and my favorite hotel, The Kelebek. 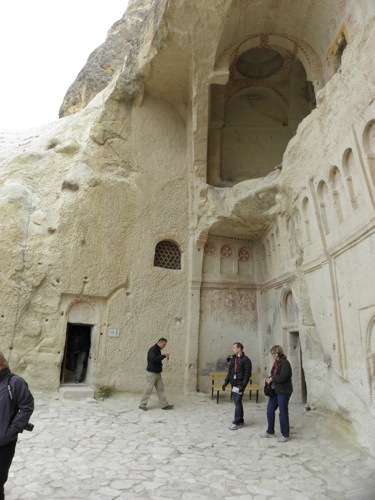 The first day we explored Göreme and its fascinating Open Air Museum of ancient churches carved into the rock. Me with the Open Air Museum behind me–no photos allowed inside the churches. Part of a carved stone church with the walls broken away. 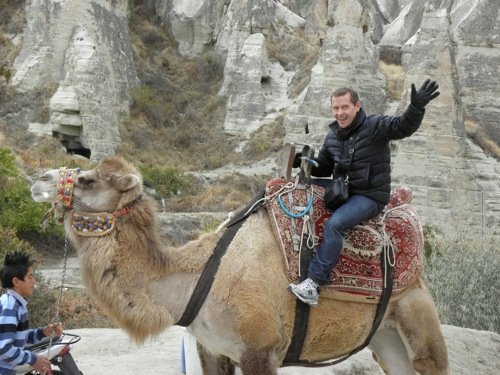 My friend Arvid atop a camel–Ride ’em Cowboy! 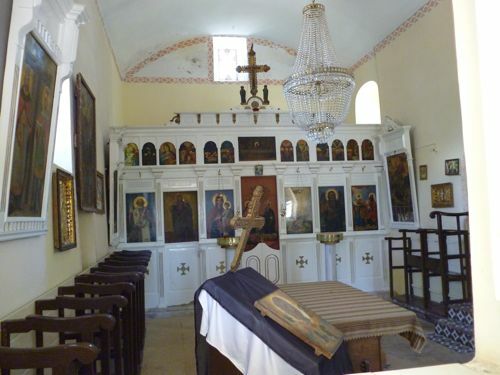 The next day we took a fascinating tour of more hidden churches, an archeological dig, and the underground city (with a delicious Turkish repast at noon). Sadly, neither Norma nor I was successful at managing the claustrophobic underground tunnels, but Arvid braved his emotional storm and made it eight stories down. 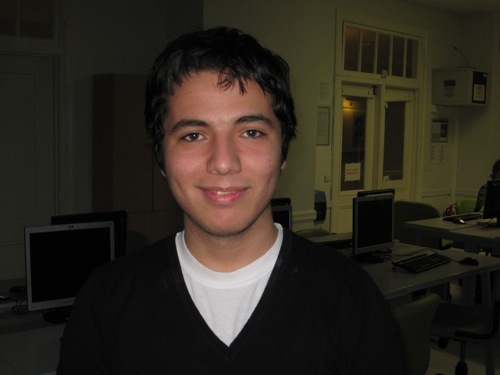 Kudos to Arvid! A carved stone church along our hike, this one with a dome–hence, it’s called the Domed Church. An interior wall of one of the churches we visited. 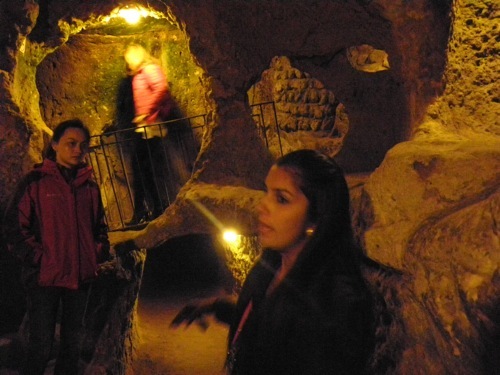 The underground city–photo by Arvid, the only successful descender (of the three of us). 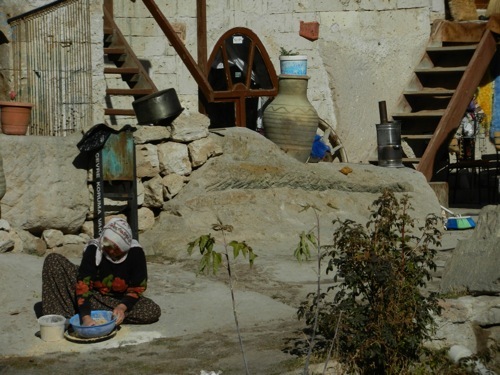 A woman we spotted along our hike, kneading or mixing something outside her home. I have a little update on the Kurban Bayram. Although people are expected to use experienced butchers for the sacrifice, many attempt to slaughter animals on their own. 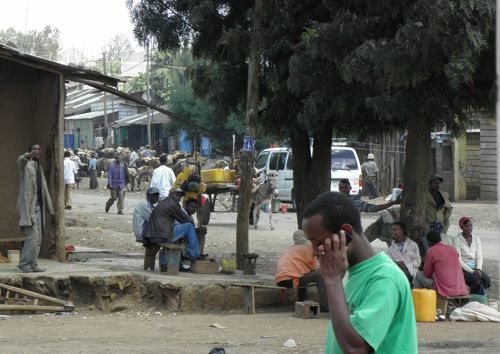 My office compatriots informed me Thursday morning that several people had died during the sacrifice. 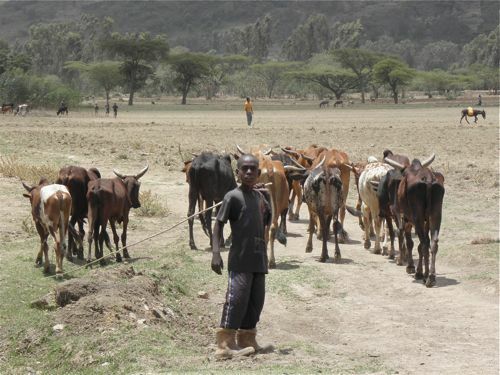 One man was sacrificing a cow on a platform, and the platform collapsed , crushing him under the animal. Two more men suffered heart attacks while trying to control animals they were intending to sacrifice. 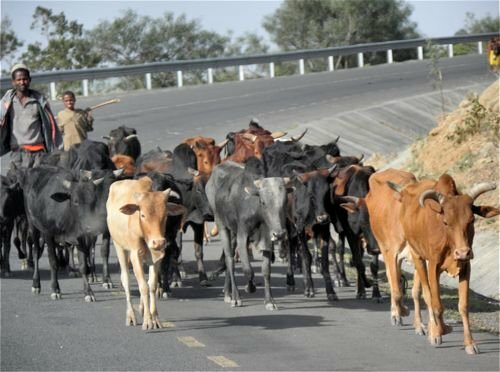 Apparently 1000 people across the country were injured in the first two days of the bayram while trying to slaughter animals. 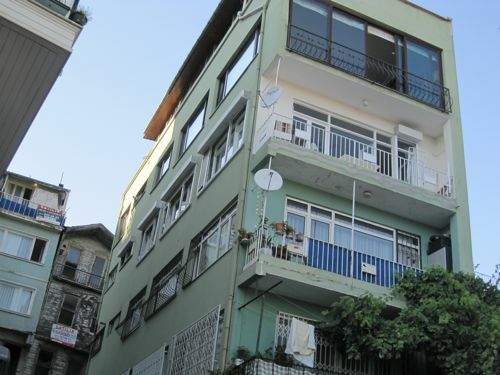 Over 500 in Istanbul sought medical attention after either cutting themselves or being injured by their unruly victims. Apparently this is the darker side of the celebration. 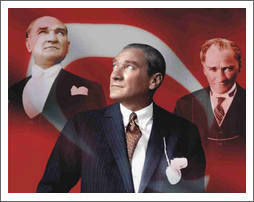 I have to admit, watching it brought tears to my eyes, probably because of how strongly it evidences this country’s reverence for the father of their country, Mustafa Kemal Ataturk. I wonder if we Americans could ever come up with that kind of collective devotion to our country or its heroes. Doubtful. Maybe to the almighty dollar, though. The only other thing I’m going to share today is the incredible dinner Arvid, Norma, and I shared on Friday evening. It was a cold, rainy day, but we still met at Eminönü to ferry across to Kadiköy for the original Iskender, a favorite dish in Turkey. It’s delightfully decadent. Arvid and I eagerly anticipate a delicious platter of Iskender. Start with crusty pide bread cut into bite-sized pieces and spread on a platter. Cover that with a generous few layers of thinly-sliced döner, spiced layers of lamb roasted on a vertical spit. It’s like the Greek version used in gyro sandwiches, but the Turks insist it’s far better (like comparing steak to hamburger, according to Arvid’s Turkish friend Harun). That layer is slathered with a spicy tomato sauce and surrounded with sliced tomatoes, grilled peppers, and a hearty dollop of yogurt. It’s brought to the table on a hot platter, then a waiter drizzles the entire plate with butter from a sizzling frying pan. Oh, my goodness! It’s the pinnacle of delicious. See the butter swimming under the bread and meat? Oh, yum! 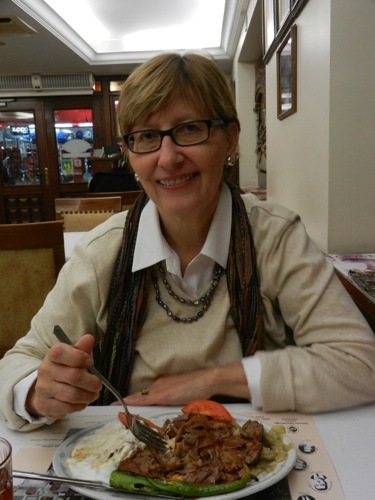 Though Norma and Arvid had experienced a wide variety of delectable Turkish cuisine, this was by far their favorite. 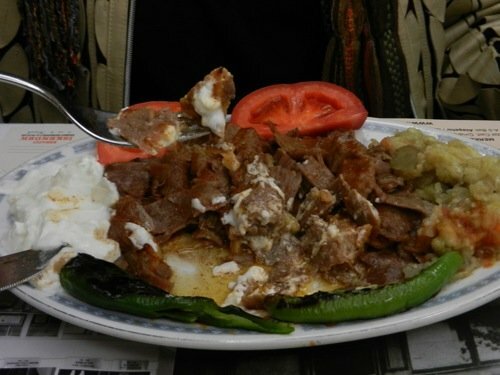 By the way, Iskender is named after Alexander the Great, who conquered Turkey for the Macedonian Empire around 300 BC. What a tribute, huh? Thus ends yet another chapter of sharing Turkey—with my friends and with you. I have a quiet week ahead, but I’ll think of something to write about. I promise. I’m having my fourteen resident students for dinner this week. That will be an adventure in itself. In a few days Turkey will celebrate Kurban Bayramı—a holiday I’d always found horrifying—riddled with roadside animal carcasses. I really didn’t get it. İrem Eren, my office mate, opened my eyes to the generous traditions of this holiday, and later I discussed it with senior Özdemir Vayisoğlu, our Bosphorus Chronicle Editor. I think I’m starting to get it. It’s all about sacrifice and generosity. 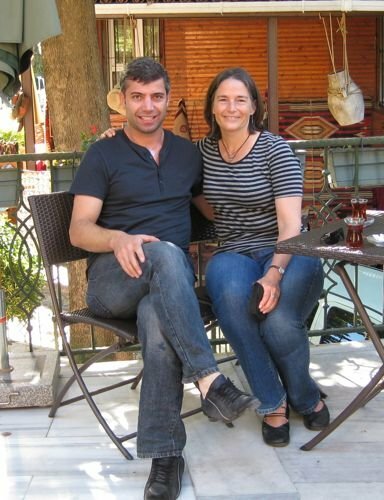 İrem and Özdemir come from smaller cities and fascinated me with tales of what their families do. When I talked with my other students I learned that about a third of their families follow the traditions of bayram. 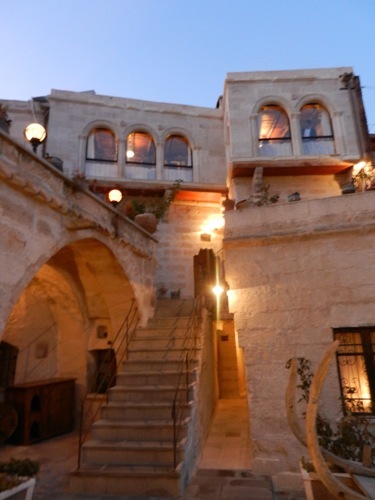 İrem generously invited me to spend Kurban Bayramı with her family, which I would have loved if I hadn’t already made plans to travel to Cappadocia with my friends from the States. A little research revealed that Kurban Bayramı is the most important Islamic religious festival of the year. Celebrating Abraham’s near-sacrifice of his son, the head of each Turkish household sacrifices a sheep on the morning of the first day of the holiday. 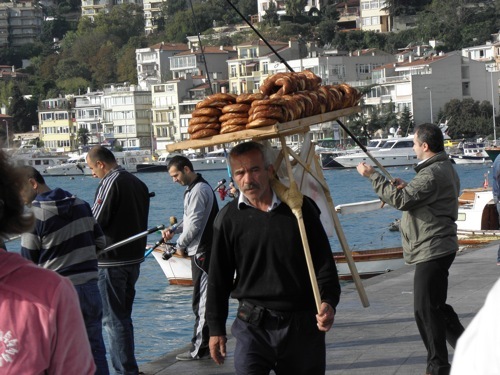 Though common all over Turkey, it’s less typical in the cities than in rural areas. 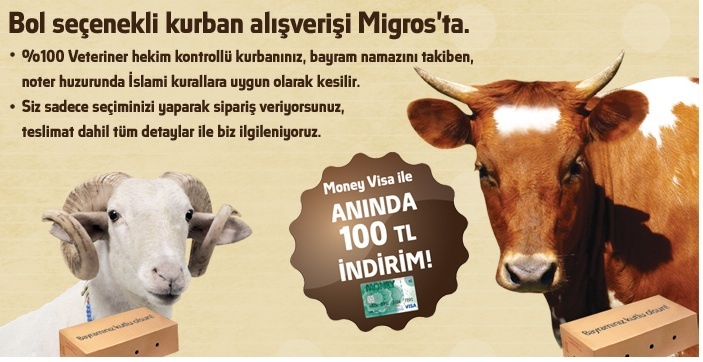 Migros, a Turkish grocery chain, offers a 100 lira discount on livestock shipments for bayram. Özdemir explained that early on the first morning of the four-day bayram everyone goes to the mosque for a short prayer called bayramnamazı. After the prayer they gather to chat in the courtyard before heading home to prepare for the kurban—the sacrifice of an animal. Wealthier families hire someone to do the kurban. He recites something from the Koran, then (a-hem) slits the sheep’s throat. I noticed that neither Özdemir nor İrem chose to speak in those terms. They seemed sensitive about the slaughter, but it is what it is. 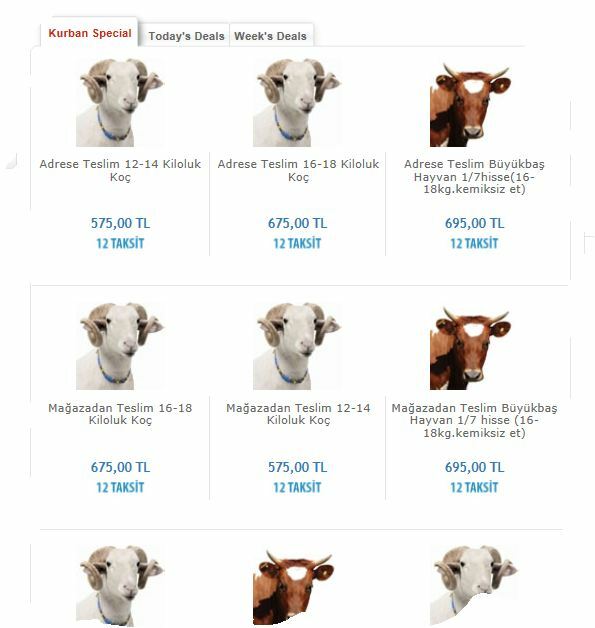 İrem’s family has a butcher perform the kurban, which might be done on a sheep, a goat, or a cow (which might be purchased together by a few families). 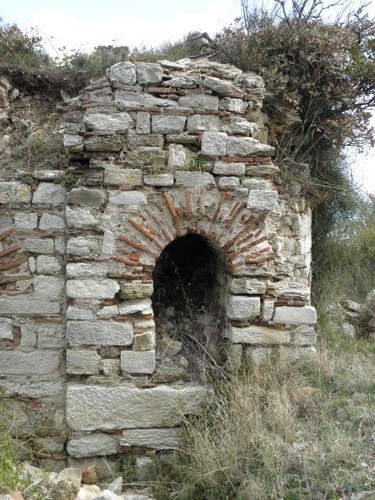 Özdemir explained that the hired man would cut up the meat into large pieces and and put into huge flat trays, which men carried into the house. There the women would divide the meat into smaller pieces and package it. In İrem’s family, her job is to make the labels for each package based on a long list they have compiled of people who they want to help. Each sheep is divided into fifteen to twenty packets, a good deal of meat. 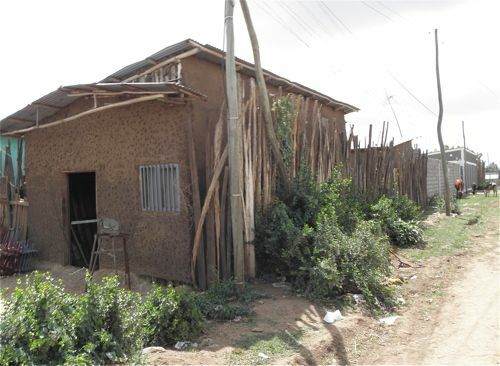 Once the meat is packaged, it is immediately piled into the trunk of a car and delivered to the homes of the needy. Of course, some meat is kept behind for serving guests. Guests and visits. The rest of the holiday is spent visiting family, friends, and business associates. 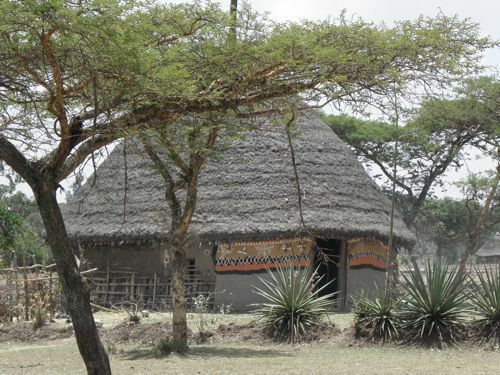 The women of the household have been baking and cooking for weeks to prepare for all the visitors. 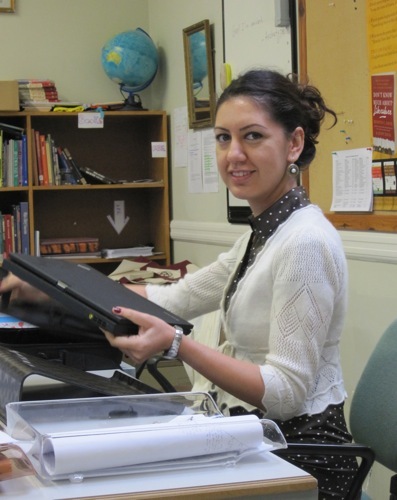 “We make a list of everyone we want to visit,” İrem explained. 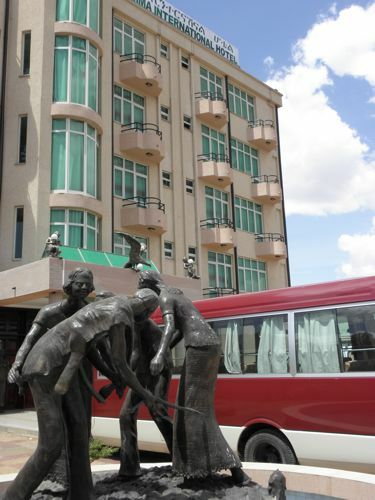 “It includes all the relatives and also friends and business associates. 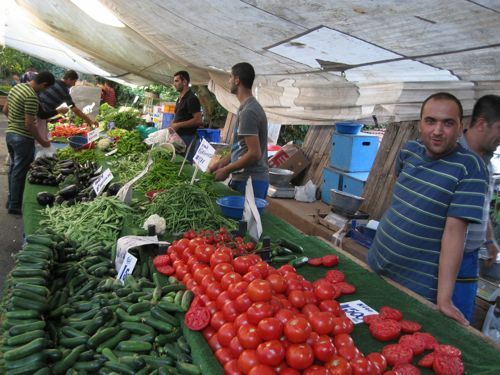 We usually have a list of about 100 people to visit in the three or four days of Kurban Bayramı. 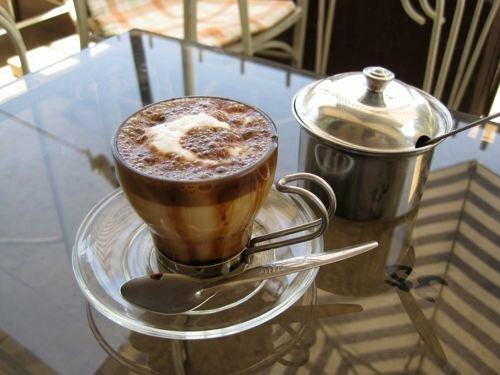 You just have about fifteen minutes to eat a little and have some tea. We usually have sweets at people’s houses, and you get so SICK of eating all the sweets. But you know Turkish hospitality. 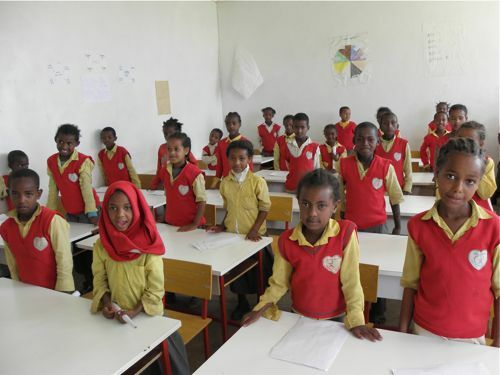 There’s no way you can say no, so you just eat some more,” Irem said with a smile. She went on to explain that when the people they are visiting aren’t home, they leave a note to let them know you stopped by. She said her father cleverly hurries to the home of anyone he sees out visiting because then he can get by with just leaving a note. With 100 people to visit, I can certainly understand. 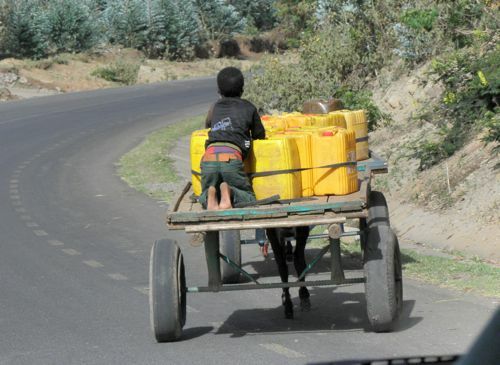 Yes, it’s a different world than most of us live in, but how often are we westerners so generous to strangers? Food for thought—pardon the pun. 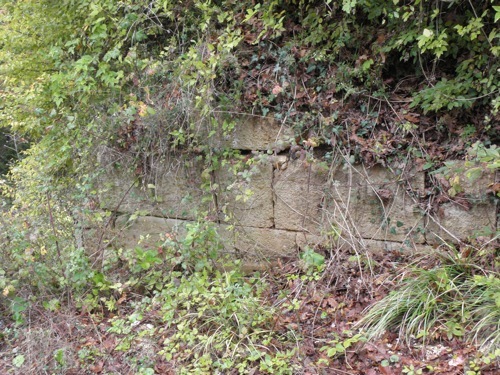 Last Sunday I touched a remnant of the longest aqueduct system in ancient history, and it’s in—Ta-Da! Turkey! 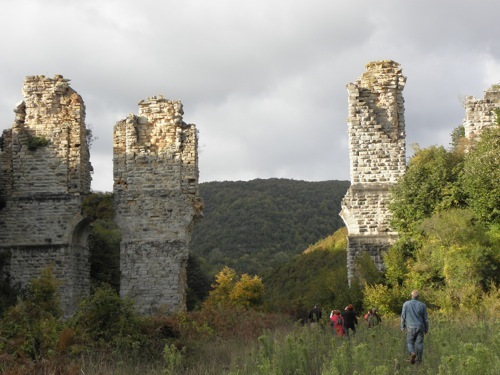 Over 250 kilometers long, this aqueduct once supplied the city of Constantinople with water from the Istranja Mountains near the Black Sea, 65 kilometers away. So why was it 250 kilometers long, you wonder? (I did.) It’s because it snaked through the mountains, tunneling through and winding around them. It was reputedly the most outstanding surveying achievement of the pre-industrial world. Impressive. A portion of the Anastasian Long Wall–impressive, huh? We left sunny Istanbul in high spirits, but clouds gathered as we rode the bus a few hours. 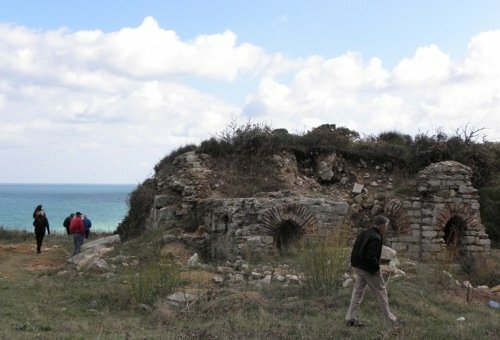 We’d been promised views of the Anastasian Wall (Long Wall of Thrace), a defense that extended 64 kilometers between the Black Sea and the Sea of Marmara. We saw small sections of this massive wall through woodsy brambles and undertgrowth, a bit of a disappointment. The wall was once over 9 feet thick and 16 feet high, but we never saw more than about a six-foot span. Our stalwart group of 30 (including our Ottoman historian guide) braved glucky mud and a light drizzle to see more, but our best sightings were actually from the bus. 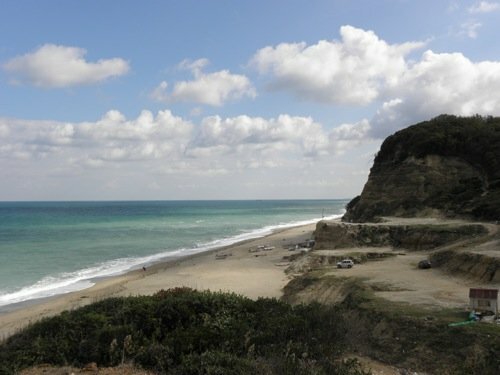 We drove all the way to the Black Sea and climbed to a high pinnacle where the wall once stood. No trace today. There were remains of a sweet ancient chapel, though, and Libby did her best to glean as many pricklers as she could from the underbrush. 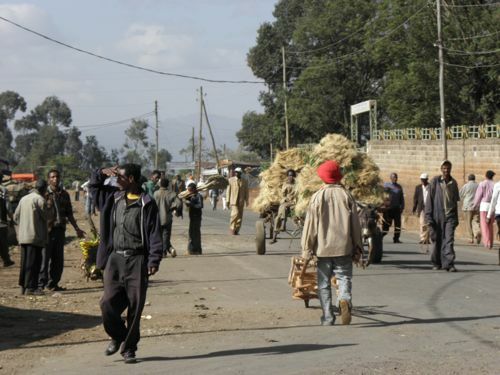 After scraping pounds of muck off our shoes, we boarded the bus again (the driver had spread newspapers on his carpeted floors) and headed for lunch. 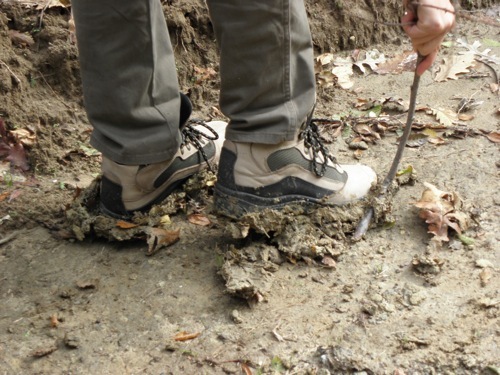 The mud caked our boots, heavier with each step. Ah, lunch! Long tables were set with artfully arranged salads, mezes, and breads. 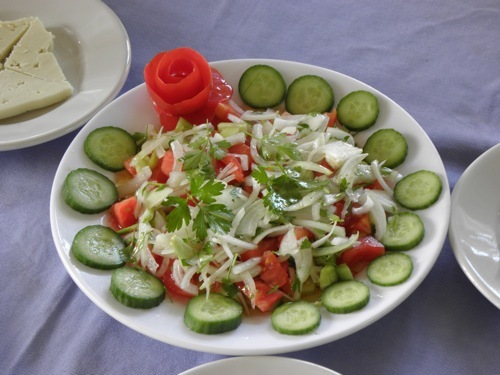 Once we’d filled up on these vegetable, cheese, and yogurt dishes, we were each brought a well-stewed piece of lamb atop a mountain of buttery pilaf. I’m generally not crazy about either, but these were divine. Libby sat under my chair eager to glean whatever she could of the meat scraps provided by a few of us. This was the loveliest shepherd’s salad I’ve ever been served. 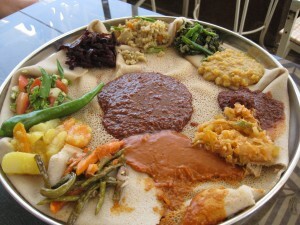 The meal had lifted our spirits, and as we drove up to view a part of the aqueduct system, my seat-mate exclaimed, “Look! This is how they make charcoal!” as he clambored for his camera. “I have to get a picture of this. 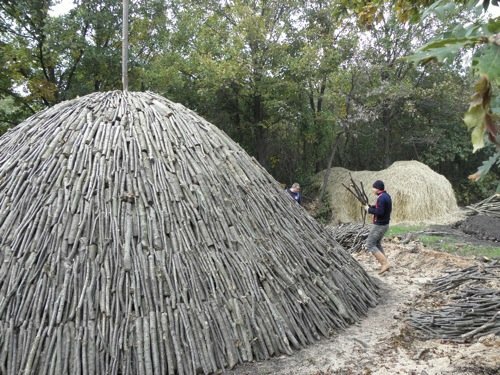 It’s what they did hundreds of years ago in Pennsylvania!” A visiting architect and design professor, he was thrilled to see the massive mounds of wood. After passing a few of these strange structures, the bus pulled over. We were all fascinated to learn that the charcoal-making process is quite an art. Logs and sticks are cut into about 2-foot lengths and piled in a circle around a 30-foot clearing. You can see how the logs are piled around the circumference of the mound. 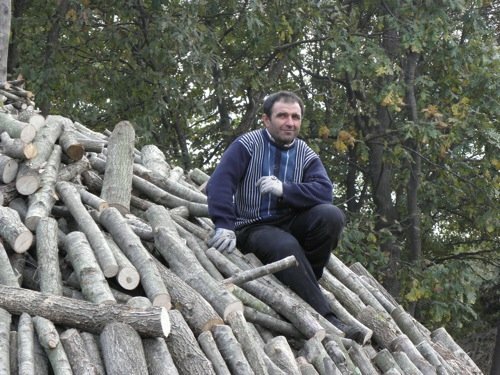 This man will arrange the loose logs that have been tossed up to him. These are stacked vertically around a small cavity to make a mound, leaving a vertical space like a chimney up the center as the mound grows. 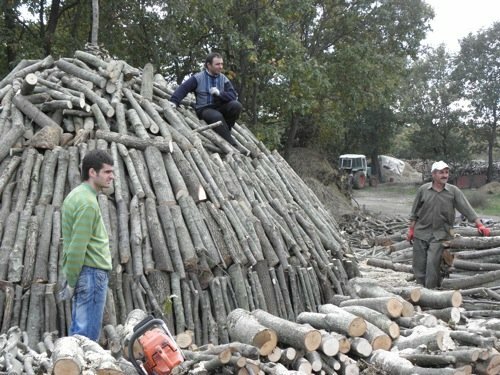 Wood is carefully stacked to leave minimal space between logs and sticks, finally resulting in an artful firewood mound about 12-15 feet high. 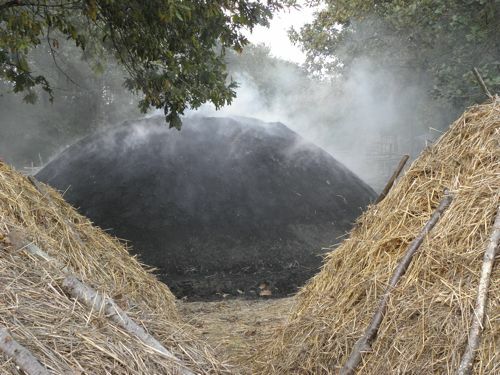 This charcoal mound is nearly complete. It’s then covered with a layer of straw and a second layer of mud. Lit charcoal is dropped down the chimney to start a smoldering fire inside the structure, and the pile smolders until all the moisture has been smoked out of the wood, about two weeks. 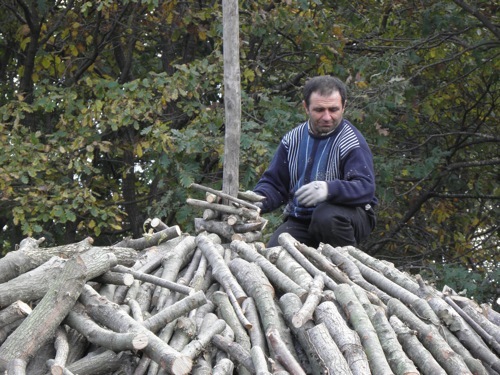 According to the worker explaining the process, seven tons of wood produce about one ton of charcoal for barbecuing, a necessity in Turkish cuisine. 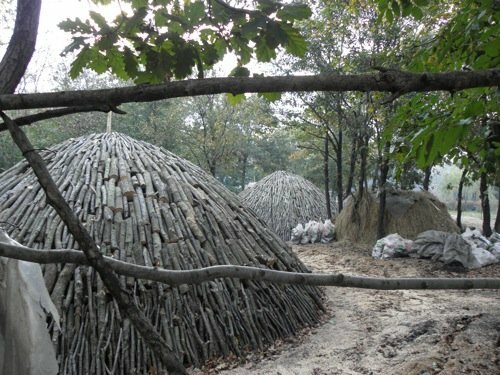 There were about six mounds ready for covering, and probably five more smoldering in this complex, located deep in the forest. A few more mounds await straw and mud coverings. We thanked the men for interrupting their work, then piled back into the bus, which bounced along three more minutes before getting dismally mired in the mucky roadway. We tried pushing, but the bus just slid sideways into the mucky ditch. It meant a longer hike to our aqueduct, so we headed off, leaving the bus driver to find a tow. Thank goodness for cell phones. As these stalwart warriors pushed, the bus just slid sidways into the ditch. The long hike to the aqueduct was well worth the work. 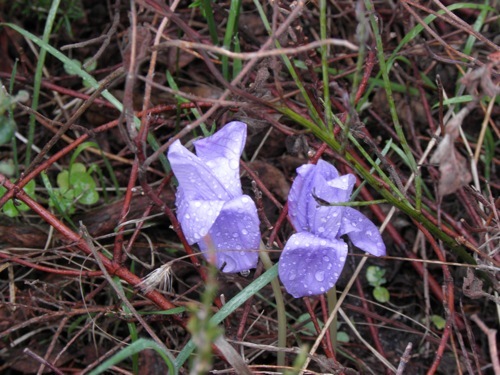 We hopped stones across a river, then discovered a bevy of wild purple autumn crocuses peering through the woods. Though they were lovely, nothing was as impressive as the stunning stone towers that met us we turned the right at the bottom of a hill. 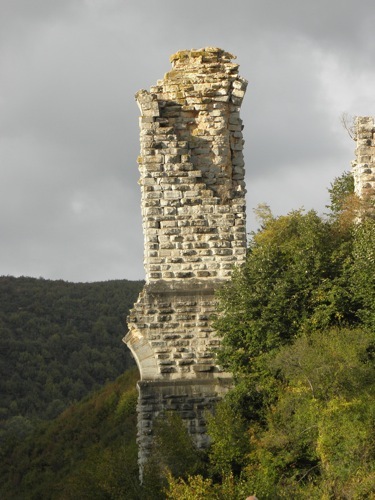 The ancient bridge’s towers were spectacular, dominating the mountainous countryside with their venerable splendor. Apparently this was one of sixty arched stone bridges in the 250 kilometers of the aqueduct system, and 18 more are still intact. We sat at the foot of these mammoth structures, marveling that the architectural genius that kept these structures standing for 1600 years. I couldn’t help but think of the laborers who’d given their lives to constructing these towers, part of someone’s dream to carry mountain water to Constantinople. After a week of blustery, cold weather, the sun god has returned to the Bosphorus. We’ve had some large double slightly opaque white jellyfish hanging out near the yachts, though they are fast being replaced by the more common saucer-like moon jellyfish. I always enjoy watching them squirt and stream through the water, though sadly they choose to congregate with the refuse that collects in the lee of the ships. UGH! 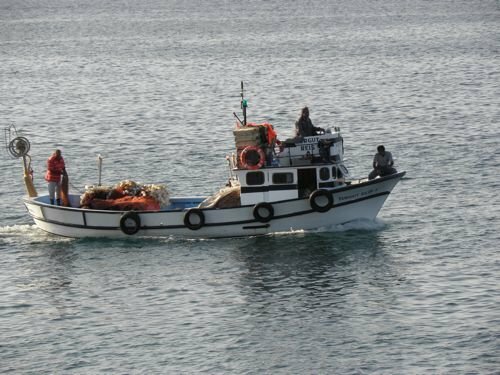 The fishermen lining the shore along the walkway have abated, partly because of the recent cold weather, but more likely because the hamsi (anchovy) season is waning. Some of the fishermen are pulling in larger fish, which pleases Libby to no end. 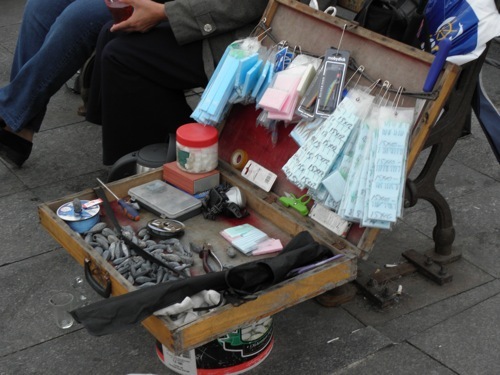 The quais also teems with tea, simit (a round sesame-covered bread like a large bagel), and sandwich sellers as well as mobile tackle shops ranging from crude boxes to large vans replete with hooks, lures, bait, and even fishing poles and reels. 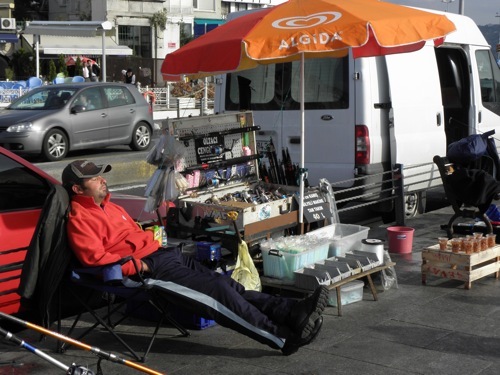 It’s fun to see these vendors bask in the sun as they await business. I don’t think it really matters whether it’s profitable—location, location, location. Something more of a production–artistic, to boot! 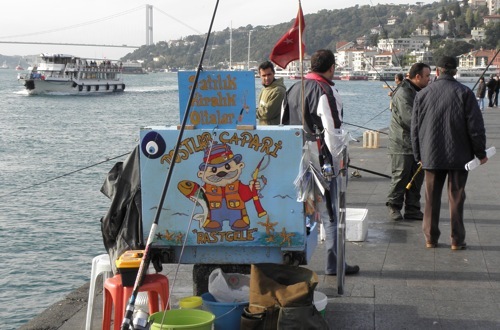 Last Saturday Kaptan Mustafa invited me for kahvaltı (breakfast) on his yat (figure it out) moored near Arnavutköy. He’d invited his English-speaking friend Haydar to join us, which was actually quite helpful, as Mustafa’s English is even worse than my Turkish. I’m getting better at conversing, but there’s a lot of repeating and backing up. It works, though. 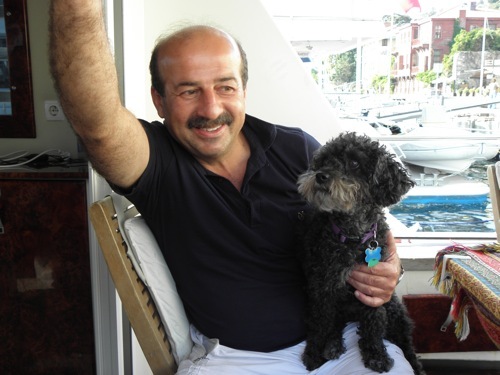 Haydar is a pilot who steers large ships through the dangerous curves and currents on the Bosphorus. 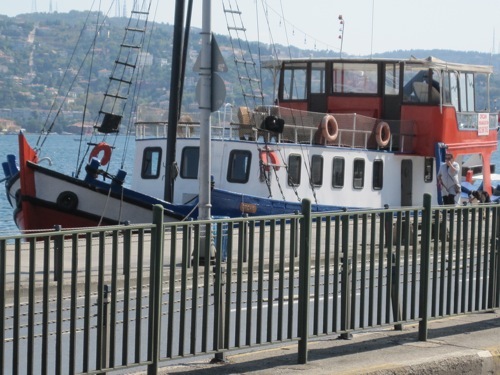 When they enter the Bosphorus, a small boat sidles up with a pilot to take over the wheel on the way up this waterway, the busiest in the world. 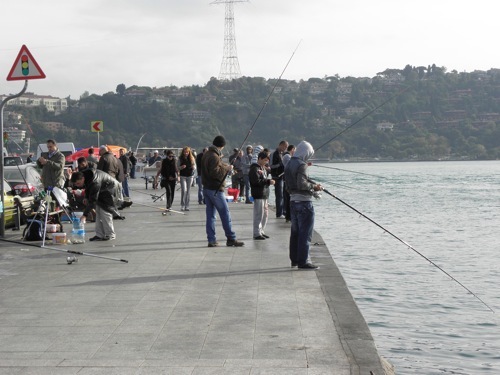 The currents are particularly difficult because a heavier current of salt water flows upstream from the Sea of Marmara, while the less saline water from the Black Sea flows downstream above it. Actually, how do you know which is upstream and which is down when the water flows both ways. Imagine, though, what happens to these opposing currents at each sharp turn of the Bosphorus (and there are at least a dozen in its 17 miles). 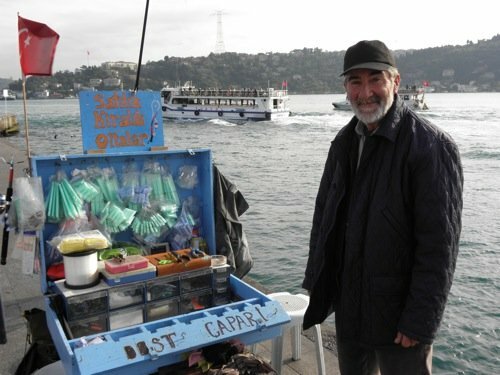 Haydar said that it takes anywhere from 2 1/2 to 4 1/2 hours to go up the Bosphorus, while it takes just 1 1/2 hours to come back down. 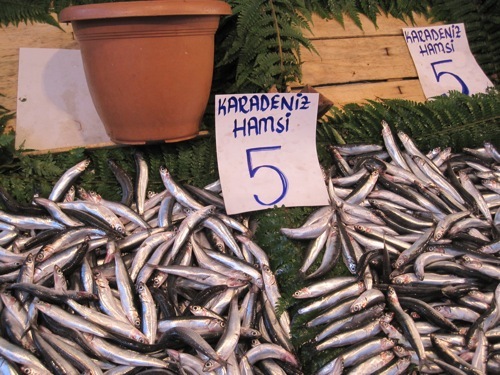 At 5 lira a kilo, these hamsi cost about $1.50 a pound. I learned this week that Turkey’s Prime Minister has proposed digging a canal from the Black Sea to the Marmara to accommodate some of these larger vessels, purportedly to ease the heavy Bosphorus traffic. It seems an impossible task, but the Turks can do just about anything when they put their minds to it. It’s been a crazy-busy week for me with events after school every day and something going on each evening as well. It seems I overbook myself no matter where I live. Tonight I came straight home from school to meet friends of my apartment owner for a pleasant visit over wine and snacks. After bidding them goodbye I threw in a load of laundry and took Libby for her evening walk. When I’m done with this blog I have to press a few pairs of slacks so I don’t look like a vagabond all week. Onward and upward! Talk about a busy week! My friend Sally just left after a fun, eventful week. Some people are just darned easy to have around, and Sally is one of them. She revels in every detail of life here, making friends at every turn. Sally with Çoşkın, one of her many Istanbul friends. Our friend David and I planned a short trip for Thursday’s Liberation of Istanbul Holiday. 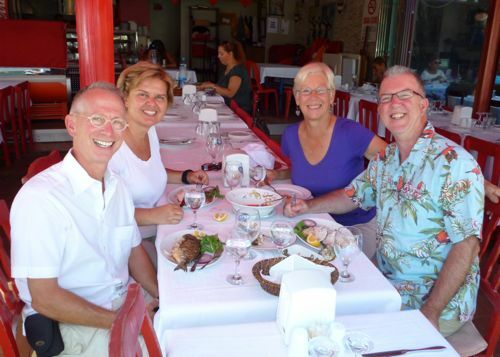 David and I worked all day Wednesday at our respective schools while Sally visited Camile (another common friend) in town, then we three met up at the Sabiha Gökçen Airport that evening. I caught a bus at 5:05 here on the European side and arrived at the airport (Asian side) at about 8:15. Over three hours to travel about 20 miles—Istanbul traffic. David was there waiting, and we hunted around for Sally, who’d been there the longest, wandering around wondering where we might be. Poor dear. 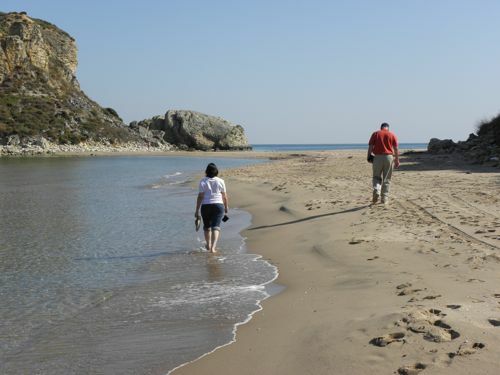 We stopped for dinner, then drove just over an hour north to Şile (SHE-lay) on the Black Sea. I’d scoped out a nice seaside resort, but when we finally found it, the entire complex was dark. What??? It was only 10:00! I’d talked to a receptionist the night before, so I tentatively pushed through the revolving door. A clerk materialized from the dark lobby, flipping lights on at the reception desk. Whew! “Are there any other people here?” I asked in Turkish. He laughed and assured me there were. I didn’t exactly believe him. He certainly had space for us, giving us a corner seaside suite that he said cost twice what we paid. Did we mind? Imagine waking to this view! We woke to a stunning seascape, and imagine our surprise when scores of Turks were already enjoying the sumptuous breakfast buffet. 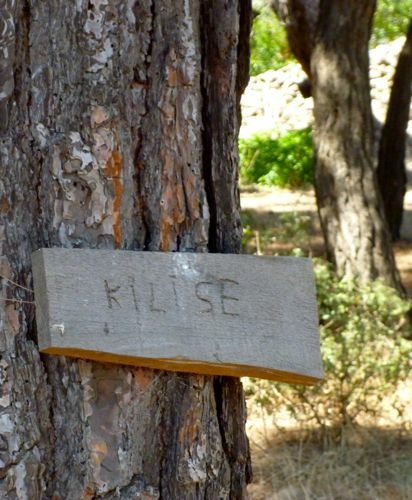 Apparently the Şile Resort Hotel teems with people all summer, but in October things get a little lean. After breakfast Sally and I donned our suits for a walk up the beach. David, uninterested in swimming, brought his Kindle. 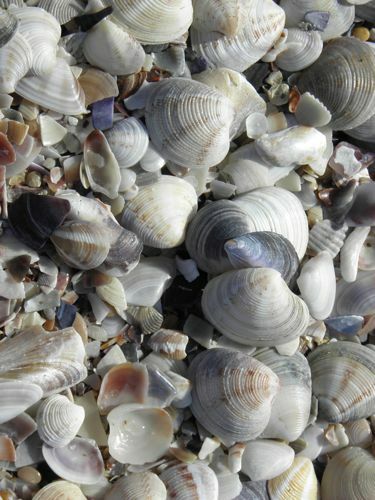 We picked shells and marveled at the pristine water as we strolled along the deserted beach. after we all snapped photos of the unique beach litter. We chuckled at a discarded computer that had washed up on shore–what was THAT about? 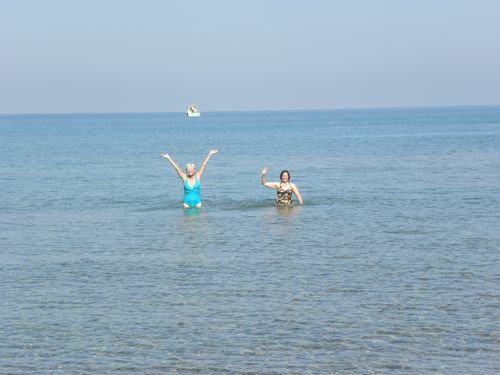 Though the Black Sea water was cool, it was warmer than most of our northern Minnesota lakes. Finally Sally and I found the perfect place for a swim, which we did. Well, first we waded out for what felt like about a mile Finally Sally dove in, and I joined her in water so shallow we couldn’t frog-kick without scraping our knees. 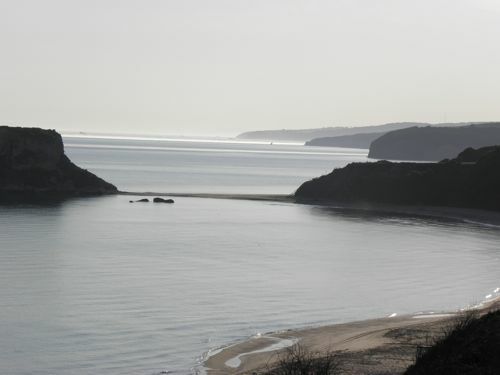 The water was still shallow quite a distance out from David–camera and Kindle in hand. Finally the bottom dropped off and we headed out to a small rocky island, feeling a bit like sea nymphs cavorting in the sun. The water was so clear we could see ripples in the sand 20 feet below us. We spent the afternoon wandering Şile, relaxing over a fish lunch in a seaside cafe, and strolling along the breakwater. 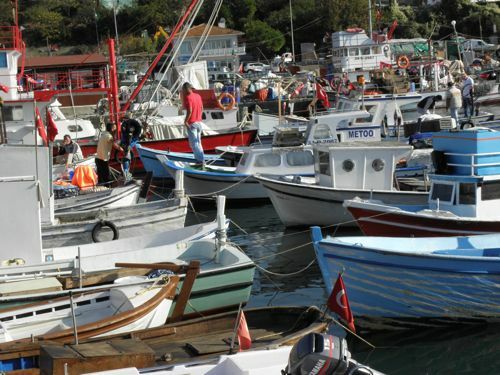 At 5:00 scores of boats left their crowded moorings to head out for the evening’s catch—probably the most action the Şile harbor sees. 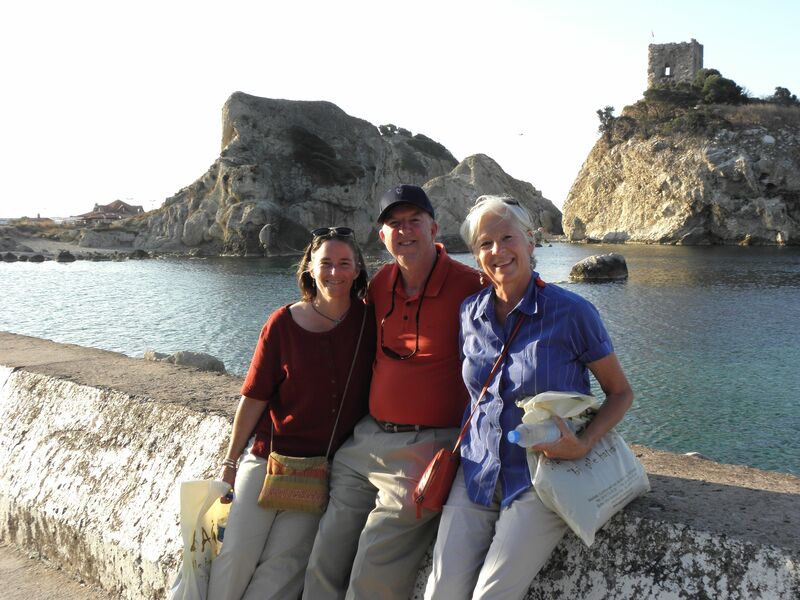 Sally, David, and I in front of the Şile Harbor fortress. Şile’s fishing boats moored three deep. 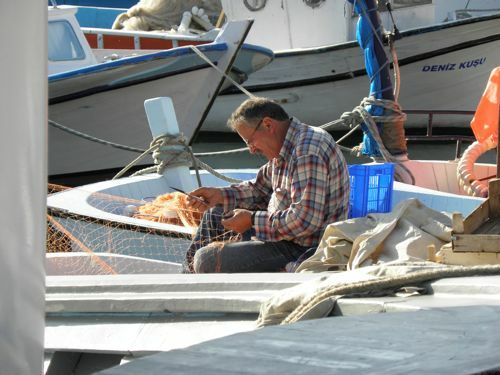 A fisherman mending his nets. A fishing boat off for the evening catch. Friday Sally and David trekked over to Üsküdar to see the stunning Şakırın Camii, the only mosque in Turkey designed by a woman (see my blog for May 25, 2009). As they were leaving, the mosque was stormed by armed bodyguards making way for a visit by Prime Minister Erdoğan. His mother had just died, and he was looking for an appropriate grave site. Apparently that kind of security is common here. 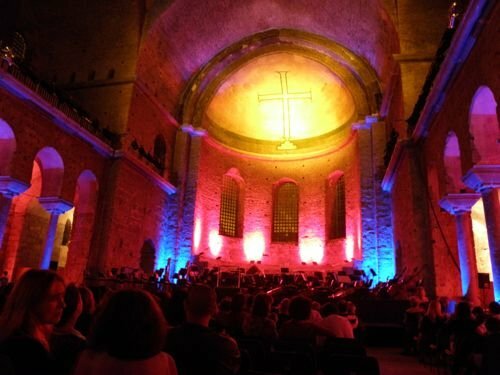 On Saturday evening we joined friends for a concert at the Aya Irini, a Byzantine church inside the walls of Topkapi Palace. The church is renowned for its incredible acoustics, and there are unfortunately only a few concerts there each year. We entered the church through an arched stone entrance and down a long, wide stone ramp. The 1500-year-old structure supposedly stands on the site of Constantinople’s first Christian church. 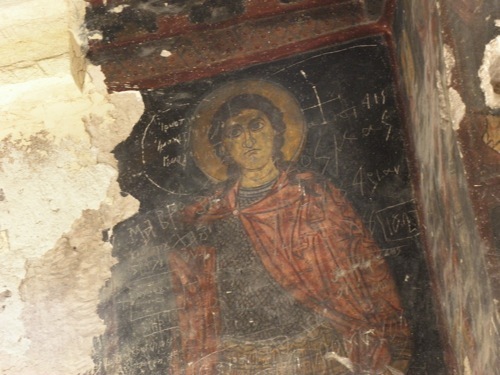 The main sanctuary was flanked by collonnades with a high gold semi-dome at the front, painted with a huge cross. Already awed at the splendor of the sanctuary, my spine tingled as the orchestra’s first notes reverberated across the centuries. I felt that same excitement when a costumed chorus filled the ancient cathedral with the booming strains of “Carmina Burana” (Carl Orff). Oh, my goodness! 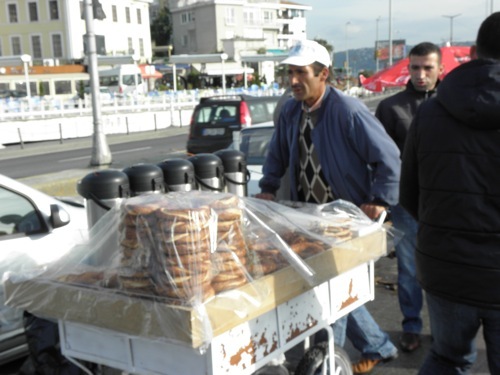 I continue to be amazed at the kindness of the Turkish people. “Good morning, Ms. Mershon. 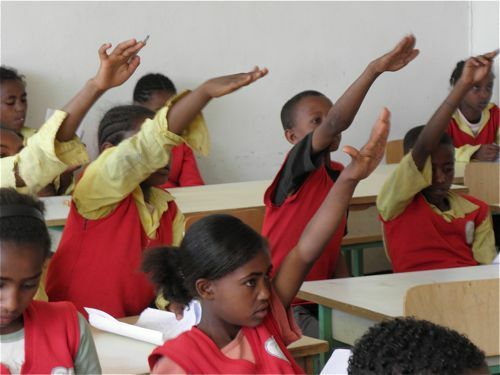 How are you today?” echoes from numerous students as I enter the building. Except for Erol, who teasingly salutes as I pass. 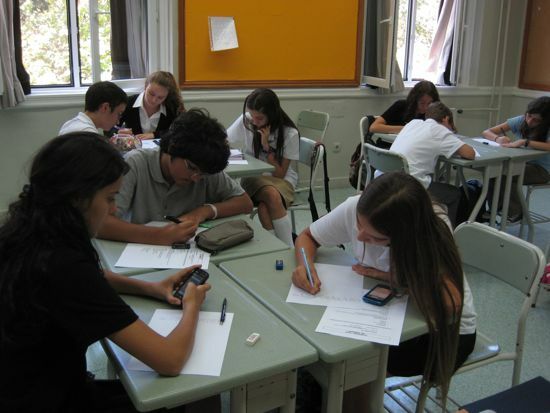 My precious and diligent 10-hour English class—what’s not to love? 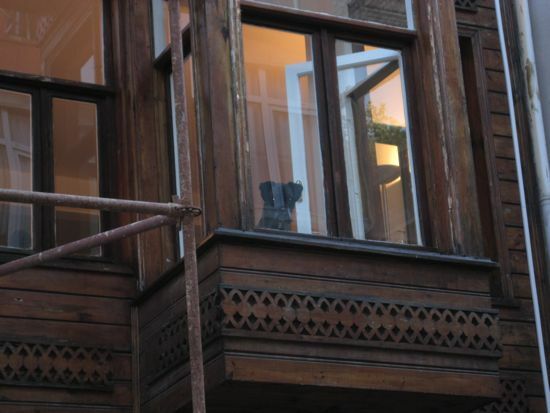 One of Libby’s 2nd-story Arnavutköy fans. I was significantly touched at the warmth of the Turks with a couple I guided through Sultanahmet a few weekends ago. 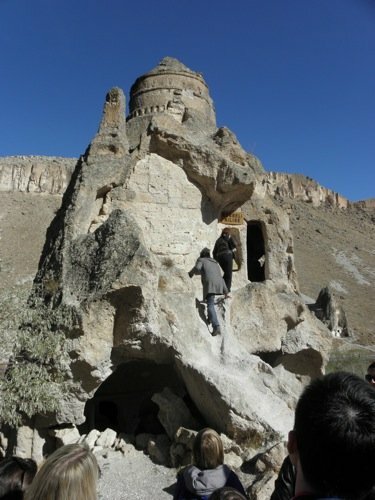 I brought them up a stone stairway to the top of the Sair Han for a stunning panorama of the city. After oohing and ahhing a bit, I commented that there used to be a little shop up there where they made baseball caps. Gary said he’d read there were 40,000 textile factories in Turkey and wondered if many were small ones. 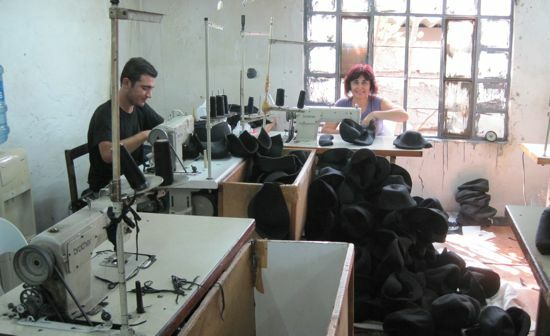 I peeked through the doorway and discovered two people working at sewing machines while a few others stacked and organized hats a la Bartholmew Cubbins—and smoked. This shop brought Bartholmew Cubbins to mind. I asked (in my most polite Turkish) if we might come in to see, and they welcomed us warmly. My friends marveled at the quality of the felted woolen caps (with earflaps), which we learned were destined for Russia. Gary tried one on, then asked if it would be possible to purchase one. 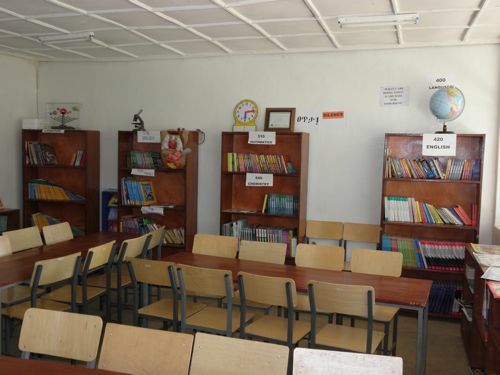 “Bir şapka ne kadar? Bir tane alabilir miyiz?” I translated. 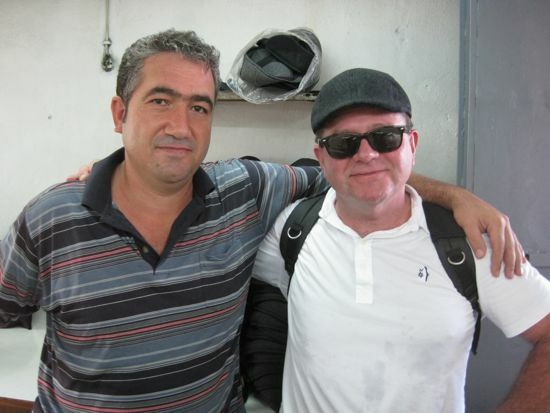 The shop manager with Gary and his new “hediye” hat. “Hayir,” (no) the older gentleman said, then handed a cap to Gary. 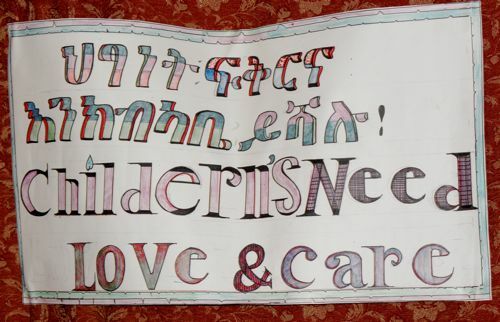 “Hediye.” It was a gift. He offered us tea, and while it steeped he guided us to a second room tho show us how they cut piles of fabric pieces and molded each stitched cap on a steamer. Though it was a small operation, he said they produced 500 caps a day. You can’t see the steam, but it’s emanating through that cap. 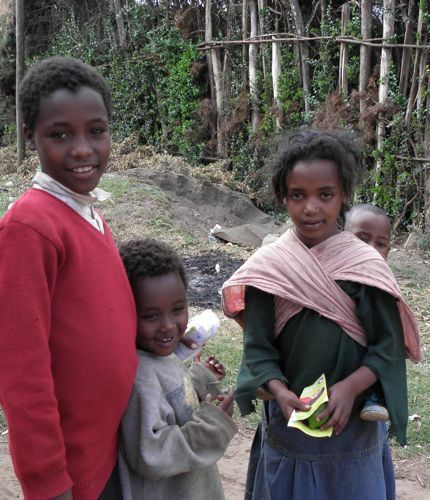 We sipped our tea outdoors, happy to be away from their cigarette smoke, yet even happier to have met them. Later we visited the Buyuk Valide Han where a young man named Serkan crafts glass lamps and “antiques” for the Grand Bazaar. I asked if he would solder a piece of my brass and copper bracelet back together, and he cheerfully agreed to. 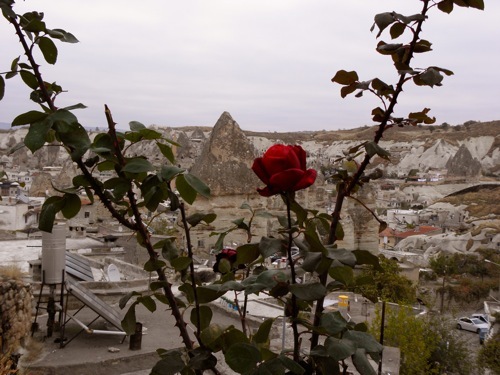 He suggested we look at the view from the han’s roof, and he found former weaver Mehdi Bey, who also brought us to see an ancient loom that has long since been hushed. 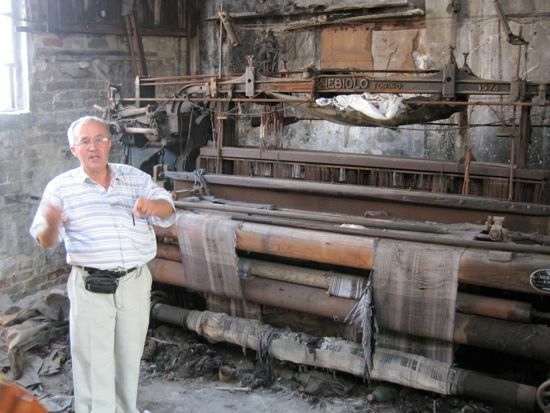 Mehdi Bey tells us (in Turkish) about this old loom that now rusts away in an abandoned shop. When we returned Serkan handed me my bracelet, now beautifully buffed and polished. I was astonished. 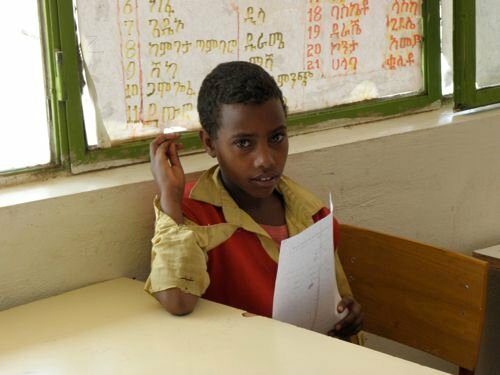 I pulled out a bill and handed it to him, but he refused, saying it was for his friend. Blush. I promised myself I’d return to buy more hanging lamps for my porch, and I was relieved that my friends bought a few items for themselves. 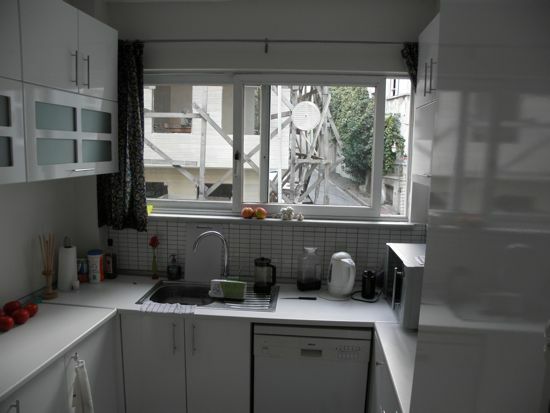 Back in Arnavutköy my kitchen cabinet knob kept coming loose. After repeatedly screwing it in tighter only to have it fall off, I decided to look for a longer screw. I’d purchased an umbrella the other day from a tiny nearby hardware store that spills out onto the sidewalk, so I decided to start there (not hoping for much). 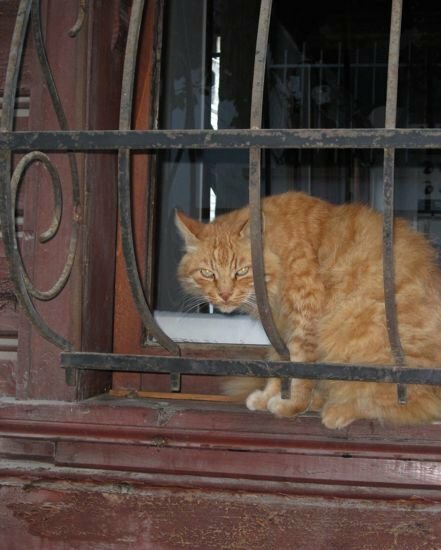 One of Arnavutköy’s less welcoming inhabitants–I think we interrupted his nap. The proprieter welcomed me into his shop, cutting short his cell phone call to greet me and offer his service. 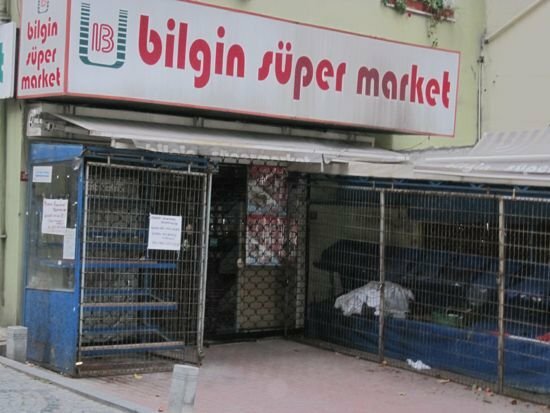 Try to imagine my pathetic Turkish request, which must have sounded a bit like, “I longer need for like this please?” The proprieter nodded, then walked back through a narrow aisle and pulled out a few drawers of assorted screws. He held my knob and screw in one hand as he rummaged through the drawer and compared it to one screw after another. He finally found one that matched my screw in width, but it was far too long. My kitchen, now brighter and happier with its new retr0-fitted knob. He pulled out a mammoth pincers and worked at that screw, turning and twisting it as he squeezed on the pincer. He ended up bending the screw, so I assumed we were both screwed. “Problem yok.” He grabbed a pliers to straighten it, then used a small nut to make sure the threads were true. He spend about fifteen minutes with me, and I was both amazed and relieved to have found a solution to my problem without a trip to the city. Whew! 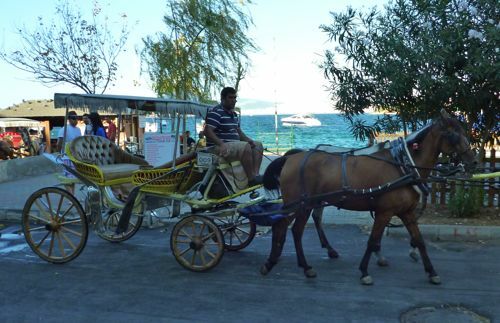 I pulled out my embroidered Turkish money purse to pay him, and he waved me away. 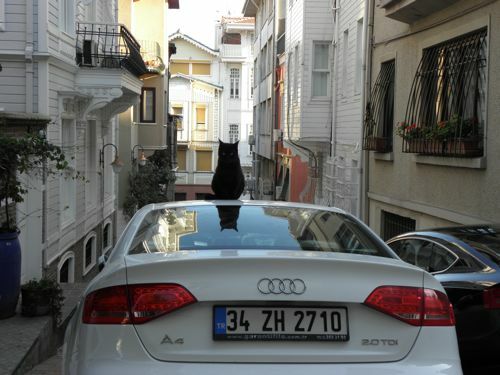 “Hayir. Hayir. Çok küçük. Hediye,” he said. Again, a gift. I pressed him to take payment, and he refused a second time, then offered me a cup of tea. Young neighbors who took a real shine to Libby. A few days ago I had an appointment with Edith, our community’s holistic healer—acupuncture, massage, pressure points, etc. She welcomed me with a warm smile, and though I think she may be nearly my age, she looked even younger than I remembered her. As she massaged my weary legs (thanks to the hills of Istanbul), we talked at length about all the recent changes in our precious village of Arnavutköy. 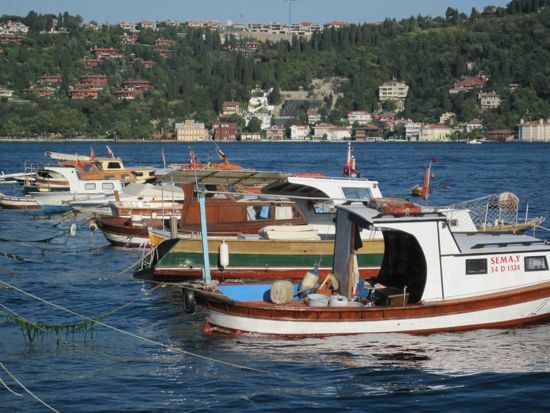 These fishing boats sit along the quais at Arnavutköy. 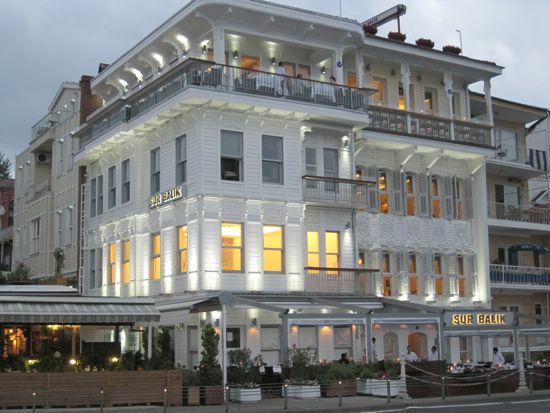 This corner used to be the deep-red Abracadabra Restaurant, now annexed by Sur Balık. 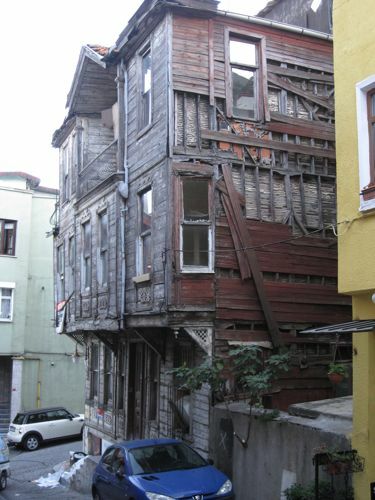 Happily, a plethora of Ottoman houses have been refurbished, and others that were beyond repair have been torn down and rebuilt. I watched one being torn down a few years ago, and it’s now a towering Victorian-looking mansion ready for new inhabitants. 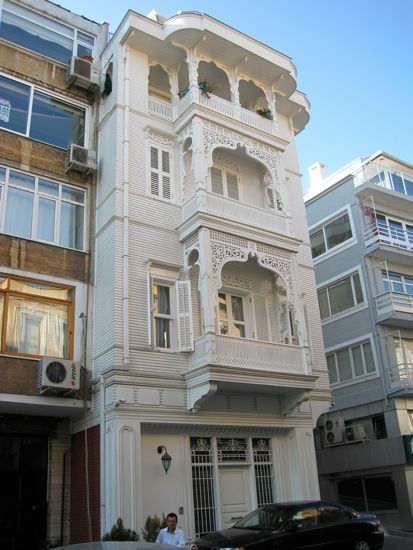 One of Arnavutköy’s stunning refurbished Ottoman homes. Who could help but be charmed by this entrance? 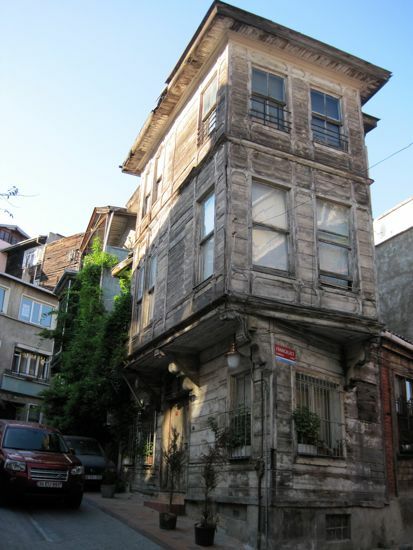 Many Ottoman houses await their turn—hope it’s not too late for this one! Another nice change is a few pet stores, one just three blocks from my apartment. Libby is thrilled. She’s also pleased that the cat population remains unchanged—unless it’s increased a bit. 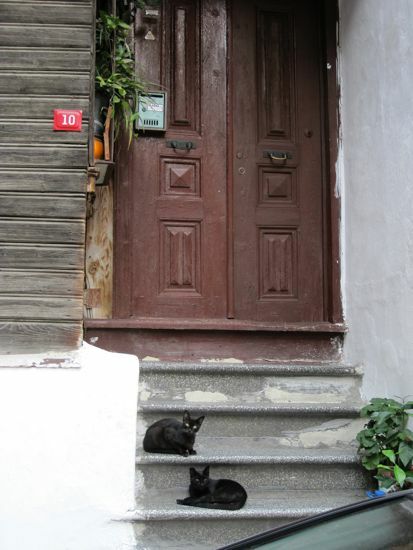 There’s no lack of cats to chase as we walk up and down the cobbled streets of Arnavutköy each morning and evening. A few Toms have the guts to stand up to Libby, who knows when to turn tail and skulk off. A surprise awaits Libby around every corner. 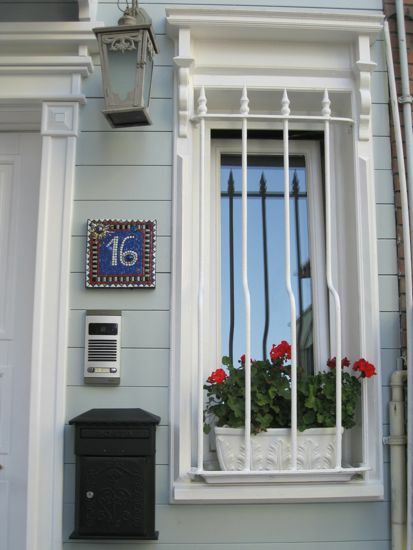 The newly cobbled streets were completed before my last departure, and I continue to find them immensely charming. 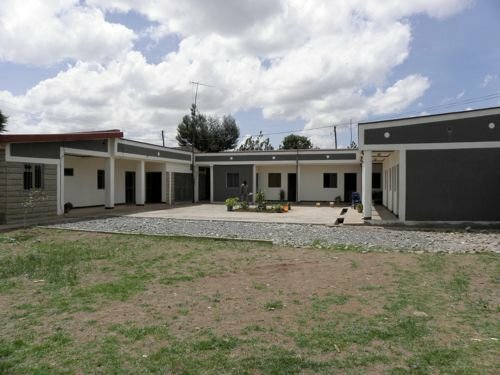 I wrote a few years ago about a gecekondu near my old apartment that had been demolished one night; the remains remain. A second one just below it has also been destroyed. What I wouldn’t give to know the real story behind all that destruction. It infuriates me. 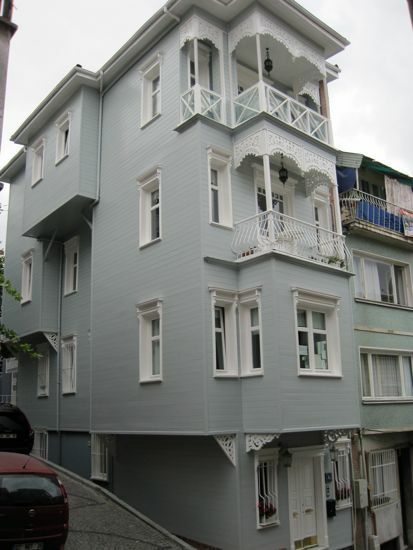 Why them, when the city’s entire hillside is rife with gecekondus (hastily built homes)? There were three small grocery stores on the north side of the village, and the largest of the three is closing down as I write. The other two are franchises, obviously hard to compete with. Edith told me a bank will be moving in. 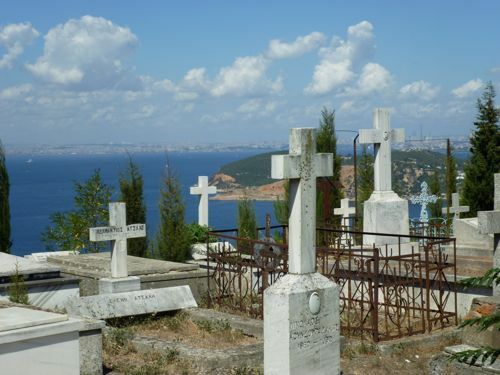 That’s a little scary, because of course we fear that this sweet village is going to become a high-end tourist destination like Bebek, the next community up the Bosphorous. What can one do? Farewell to this super market that was open just yesterday–these bins filled with produce. 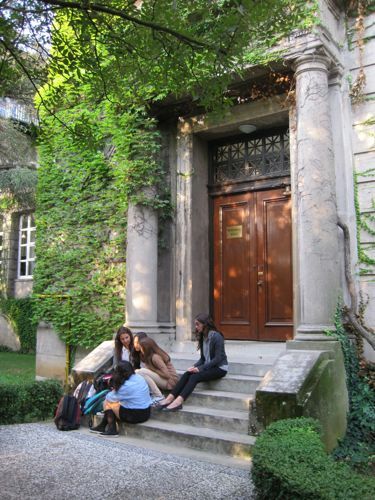 An early morning shot of Robert College–prompted by the Morning Glories. One change that makes me a bit sad is our night view. 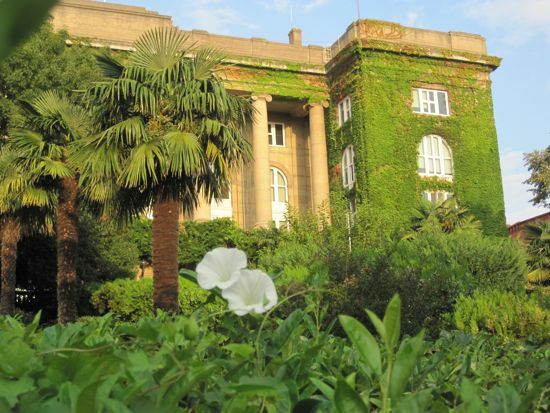 They finally finished cleaning the facade of the picturesque Kuleli MIlitary School across the water, and it looks gorgeous during the day. Unfortunately, the night lighting is bizarre–white towers with gold lighting between them. Some changes just don’t work for all of us. Another thing that’s still the same is an ancient ruin just below my balcony. I look out on ancient brick-and-stone arches from who-knows-what kind of structure. It’s reassuring to know that some of these relics are being preserved in spite of the escalating property values in this picturesque Bosphorous community. 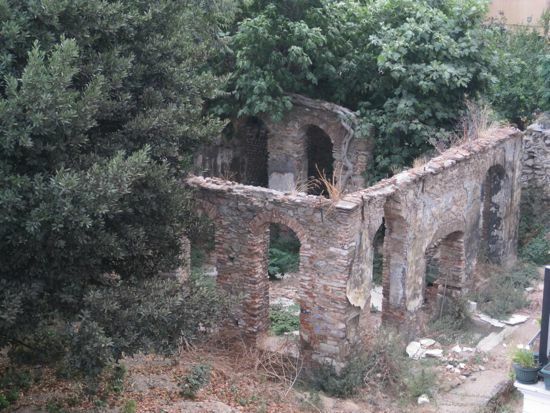 This ruin still stands just below my balcony.